Wide Asleep in America: The Consistency of Official Iranian Commentary, Part II:Are Rouhani's Statements Really a Huge Break from the Past? Are Rouhani's Statements Really a Huge Break from the Past? A Times of Israel headline posted early Friday morning announced, "Rouhani: 'Iran Will Accept Whatever Palestine Decides." 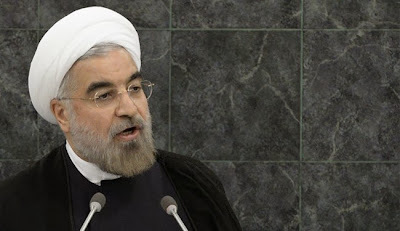 The article opens by stating that Iranian President Hassan Rouhani, speaking at an event sponsored by the Council on Foreign Relations and the Asia Society in New York, said "that the Palestinians should not have 'to pay' the price of Nazi crimes against the Jews, but that 'whatever the people of Palestine accept [for a peace accord], we shall accept as well.'" The headline was later changed to read, "Rouhani: Palestinians shouldn't have to pay for Nazi crimes against the Jews." We believe that all the Muslims, Palestinians that have been displaced or are refugees must have an opportunity to come and live where they like, alongside other people there. They should refer to the ballots and see what people say. And we will submit to that will and to that ballot and accept it. Therefore, what I'd like to say here is that when it comes to the settlement and resolution of regional issues, we believe that the only path is through the ballot box, through democracy. And we believe that war is not an answer for any of our problems. The Times of Israel report - especially through the promotion of its original headline (still seen in the article's URL) appears to intimate that this is a new position of the Iranian government. Same goes for the Jerusalem Post, which ran a similar story entitled, "Rouhani on peace process: Whatever the Palestinians accept, Iran will accept," and quoted the Iranian president as saying that "the decision makers about Palestine are the people of Palestine," in response to a question about the stagnant Israeli-Palestinian peace process. This has been the constantly repeated position of the Iranian government for years, consistently reiterated for years by Rouhani's presidential predecessor, Mahmoud Ahmadinejad. In August 2006, Ahmadinejad was interviewed by Mike Wallace for 60 Minutes. He told Wallace, "We have said 'allow Palestinian people to participate in a free and fair referendum to express their views.' What we are saying only serves the cause of durable peace. We want durable peace in that part of the world. A durable peace will only come about with once the views of the people are met. So we said 'allow the people of Palestine to participate in a referendum to choose their desired government,' and of course, for the war to come an end as well." Before airing on CBS, these statements were edited out of the interview. The following month, in an interview with TIME magazine published on September 17, 2006, Ahmadinejad stated, "Our position toward the Palestinian question is clear: we say that a nation has been displaced from its own land. Palestinian people are killed in their own lands, by those who are not original inhabitants, and they have come from far areas of the world and have occupied those homes. Our suggestion is that the 5 million Palestinian refugees come back to their homes, and then the entire people on those lands hold a referendum and choose their own system of government. This is a democratic and popular way." "The Palestinian people should decide what to do," Ahmadinejad told Anderson Cooper during his annual visit to New York that year, continuing, "And among Palestinians, there are Jews, Muslims and Christians." In an interview with the Washington Post's Lally Weymouth, Ahmadinejad said, "Our suggestion is very clear: Let the Palestinian people decide their fate in a free and fair referendum, and the result, whatever it is, should be accepted." At a press conference on September 22, 2006, he declared, "There are Muslims and Christians and Jews among the Palestinian people. We say the people of Palestine should choose. We do not say that it should be the Palestinian Muslims. For they lived in peace and harmony in the past... And the problem started. Let the people choose and see what will happen." The following year, he told Diane Sawyer, "We believe that in Palestine, there should be a referendum and Palestinians, Muslims, Jews, any Palestinians, and this is based on international regulations, and I think it's their right to determine their future. Any decision made by Palestinians must be respected, and I think this is a very clear proposition." In an interview on French television, Ahmadinejad said, "I think the people of Palestine also have the right to determine their own fate. Let them choose for themselves, the Christians, the Jews and the Muslims. That is, all the Palestinians who belong to that land can participate in the referendum." Our proposal to the Palestinian plight is a humanitarian and democratic proposal. What we say is that to solve this 60-year problem, we must allow the Palestinian people to decide about its future for itself. This is compatible with the spirit of the Charter of the United Nations and the fundamental principles enshrined in it. We must allow Jewish Palestinians, Muslim Palestinians and Christian Palestinians to determine their own fate themselves through a free referendum. Whatever they choose as a nation, everybody should accept and respect. In 2008, he urged on NPR that Palestinians must be able to hold a "free referendum to decide the future and the nature of its government," and said on DemocracyNow! that "people have to decide and choose their own fate, the right to self-determination. If they would like to keep the Zionists, they can stay; if not, they have to leave," he said, adding, "Wherever people decide, we will respect it. I mean, it's very much in correspondence with our proposal to allow Palestinian people to decide through free referendums." In his address to the United Nations General Assembly on September 23, 2009, as Ahmadinejad called for the "restoration of the inalienable rights of the Palestinian people by organizing a referendum and free elections in Palestine in order to prepare a conducive ground for all Palestinian populations, including Muslims, Christians and Jews to live together in peace and harmony." Iranian leader Ayatollah Ali Khamenei has long endorsed this very position. In 2011, speaking at conference in Tehran, he stated, "We do not seek to drown the immigrant Jews in the sea, nor impose UN rule. We propose holding a referendum among all Palestinians." As recently as his last visit to the United Nations, in September 2012, Ahmadinejad held the same line. "We say that occupation should be done away with. War-like behavior should be done away with. Terrorism should be done away with." he said to Charlie Rose. "We say do away with these things. And we have also suggested the solution. We have said the solution is that the Palestinian people should decide in a free election for their own country, their own land." Clearly, while the messenger has certainly changed and the prospects for diplomacy have never been better, the message has actually remained largely the same. Unlike his predecessor, Rouhani is a seasoned diplomat with a moderate tone and fewer axes to grind and his speeches and interviews have been palatable for, if not positively received by, an attentive Western audience. Nevertheless, when reviewing the record, it is a bit disingenuous to pretend his statements represent a stark policy shift away from past Iranian government positions.